Extracts Science Under Siege by Michael Fumento Page 358. This book has already discussed the fact that many of the values held by environmentalism are simply a matter of faith without science. Yet, sometimes that faith may go so far as to constitute something approximating religion. Noting that one (allegedly) scientific theory the Gaia theory actually claims that the earth is a living organism, essayist Charles Krauthammer writes that "contemporary environmentalism...indulges in earth worship to the point of idolatry." Cathy Young, writing in the Detroit News, quoted one environmentalist saying his religion is "deep ecology," while a letter writer to the editor of The New York Times says she won't use a clothes dryer, conceding that this might have little impact on the environment but "like all religious rituals, the importance of these acts lies not so much in their effect on society as in their role in the life of the believers." The writer went on to say: "The environment is not a political cause. It is a religion. We earth lovers are not just another special-interest group. We are prophets, would-be transformers of the world. We are not seeking merely a new law or a new program, but a new vision to guide us." But are such worshipers of nature as these at the very extreme end of the environmental activist spectrum? Only, perhaps, in their choice of words. In early 1990, Carl Sagan and twenty-two other well-known scientists appealed to world religious leaders to join them in protecting the environment. At a Moscow conference Sagan asserted that there was "a religious as well as scientific dimension" to the problems of global change. The scientists, who included physicist Hans Bethe, MIT President Jerome Weisner, and evolution theorist Stephen Jay Gould, signed an appeal stating that "efforts to safeguard and cherish the environment need to be infused with a vision of the sacred." Nature worshipers often approach environmental issues with the unreasoning zeal of crusaders in a holy war. That was clearly evident in the wording of the 1972 Clean Water Act, which called for a zero level of discharge into the nation's navigable waterways by 1985, a declaration akin to that of a preacher urging his congregation to cleanse themselves of all sin. It is impossible to prevent all pollution. Pollution is a by-product of processes, both natural and man-made, that allow life to sustain itself. When a bear relieves itself in a stream, that's pollution. It can be harmful. Drink out of that stream without disinfecting the water and you may become intimately familiar with the inside of your toilet bowl. Man-made pollution can be minimized, but not completely eliminated. By assigning the goal of elimination, the pollution problem is turned into a crusade and into a moral one at that. Pollution is no longer seen as a part of life and part of the ecosystem, but as an enemy to be dealt with only on the basis of unconditional surrender. A quasi-religious moralistic approach makes very difficult or impossible the application of cost-benefit analysis and results in massive amounts of money being thrown at problems that have been identified as the enemy, leaving little money for problems that may be just as severe or even more so but haven't been made the subject of anyone's particular crusade. It should be disconcerting to hear that the author of The Genesis Strategy: Climate and Global Survival, Stephen Schneider who is probably quoted more frequently about global warming than any other authority told Discover magazine in October 1989 that scientists should consider stretching the truth "to get some broad-based support, to capture the public's imagination." Said Schneider: "That, of course, entails getting loads of media coverage. So, we have to offer up scary scenarios, make simplified, dramatic statements, and make little mention of any doubts we may have. . . . Each of us has to decide what the right balance is between being effective and being honest." 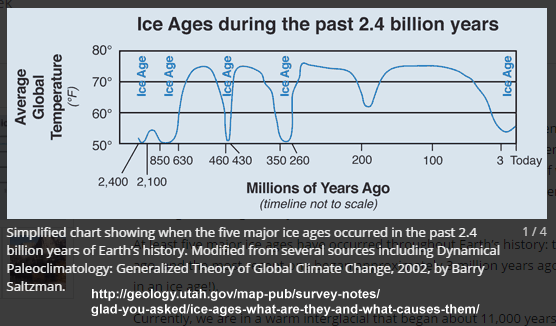 It should (also) be disconcerting to hear that the same National Academy of Sciences that has lent qualified credence to the global warming theory warned in 1977 that a new ice age "is upon us," citing "evidence as diverse as the duration of arctic snow cover, animal migration, sea surface temperatures and microfossils on the ocean floor, not to mention declining average global temperatures" (emphasis added). It should be disconcerting to hear that Stephen Schneider wrote a book back in the 1970s warning that the world might be facing and must take steps to prepare for a "Little Ice Age," and that his acknowledgments page in that book reads like a who's who of anti-industrial environmental apocalyptics, with the first acknowledgment going to Paul Ehrlich. In Vice President Gore's aforementioned essay in Scientific American, two conspicuous words popped up: "radical" and "crisis." Those two words appear repeatedly in the environmentalist literature of the 1990s. Throughout history, men have waited in the wings for a crisis during which to strike. But if it is true that the confusion of a crisis allows small minorities to seize power they could not otherwise have gained during more stable times, so too can a manufactured crisis do the job as well. Long before the multitude of crises discussed in this book ever occurred, the nature worshipers, the technophobes, and the agrarian utopians sought to impose their values on society. As Senator Timothy Wirth (D-Colo.) put it: "We've got to ride the global warming issue. Even if the theory of global warming is wrong, we will be doing the right thing, in terms of economic policy and environmental policy." Joseph Paehlke, in his book Environmentalism and the Future of Aggressive Politics, writes: "Natural and social scientists have tended to view their role as scientists and citizens as separate. Environmentalists, in contrast, have generally seen these roles as irretrievably linked. Not since the nineteenth century, when Marx, Engels, and many others sought (so wrongheadedly at times) to blend science and ideology, has there been so explicit an effort in this regard." Paehlke is not entirely unsympathetic to this effort, but he cannot fail to point out that "Marx and Engels erred in part because they made little attempt to distinguish between the historical outcomes they preferred and those predicted 'scientifically' using their methods." Likewise, he says, "environmentalists have tended to use science to extrapolate fearsome futures." Paehlke says that to achieve the environmentalists' ends, "environmentalism must blend the natural sciences, values, and social sciences in a distinctive way. No particular set of findings in the natural sciences can determine an ideological perspective. The findings of the ecological, toxicological, and resource-related sciences must be integrated conceptually, generalized at a level with which many natural scientists are uncomfortable." That may be a nice prescription for success for environmentalist activists' goals, but what of the goal of scientific veracity? What if the goal is simply to allow humans to use the earth's resources while causing the minimum damage? That is why, as Paehlke later notes, "many scientists deeply resent the claims and style of environmentalists." Those scientists resent the environmentalists for the same reason a good doctor resents a quack. Both make money, but the good doctor wants to heal, while the quack has no such motivation. When you've worked as an epidemiologist for decades and somebody comes along with a highly publicized book turning epidemiology on its head, you resent it. When you've worked in carcinogenesis for decades and somebody publishes a report on an alleged cancer-causing agent that gets tremendous media attention but has a kindergartener's understanding of what causes cancer, you resent it. Some of these scientists are very concerned with the earth's welfare, some perhaps not. Some vote liberal, some conservative. But they don't like to see their areas of science subjugated to someone else's political cause. They don't want to see a "blend[ing of] the natural sciences, values, and social sciences," because inevitably this leads to the subjugation of scientific truth. Astronomer Carl Sagan speaking as a climatology expert is one example of this. Entomologist (studies of insects) Paul Ehrlich speaking as an expert on human population patterns is another. The Natural Resources Defense Council (NRDC) was founded in 1970 and is the legal arm of the environmentalist movement. The NRDC doesn't conduct environmental studies itself and ranks as one of the most powerful and well-funded environmental organizations with 100,000 members. The Wall Street Journal called it a "Shadow EPA" and their politics are extreme Left, according to Gregg Easterbrook, a "a self-described liberal" and regular writer for the Atlantic, Newsweek, and the New Republic. The one environmentalist who is probably most identified with being antitechnology is lobbyist and lecturer Jeremy Rifkin. In a review of his most recent book, A New Consciousness for a New Century, Gina Maranto notes in The New York Times Book Review that Rifkin "romanticizes the lot of the feudal serf by presenting him as living in a state of 'communal self-sufficiency,' on a land that for hundreds of years provided him with 'Spiritual as well as economic security." In fact, points out Maranto, "the life of the feudal servant was truly nasty, brutish, and short." Indeed, the life of the modern peasant continues to fit that description. There are serious, serious problems in the thinking of a man who believes it would be good if we all became serfs again. But Rifkin is in the mainstream of the environmentalists.